Tags help you organize tasks on a whole new level and provide them with a renewed sense of purpose! Tags shine when you need to group, view, or manage related tasks that don't have a strict status or location in your Team's structure. The beauty of tags is that they're unrestricted. However, because of this, it's important to have a game plan for how you want to use them so they don't become unruly. However you decide to use tags, make sure your whole team is aware of your process so you can maintain open communication. Tags are a ClickApp implemented at the Space level. Therefore, all tags available in one Space are not necessarily available in another. However, if you move a task with a tag to a Space that doesn't yet have that tag, then the new Space will automatically inherit that tag. No need to do any manual work! When renaming, removing, or deleting tags, the changes you make will affect all tags across the entire Space. Removing a tag means untagging that task. Whereas, deleting a tag actually deletes the tag from the Space (and deletes it from every task that has that tag in the Space). Tags are an optional feature in ClickUp. To enable them in your Spaces, proceed to the Spaces page in your Settings. Under the ClickApps heading, flip the toggle on for the Tags feature. 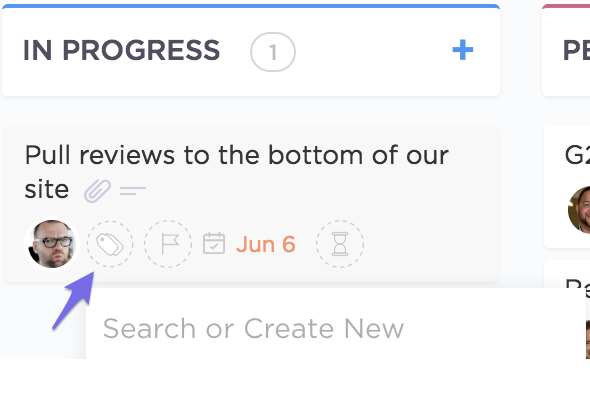 Task View: Click the tag button in the upper left section of your task to edit, delete, or add tags. You can also hover over existing tags and press the red X to remove them. List View: Select the tag button on any unopened task in List View to search for or create new tags within the task. Board View: Hover over a task in Board View to see the tag button appear. Click on the button to start adding tags to the task! Once you've enabled Tags within a Space, you can utilize them to filter your tasks in List View. Just click on the filter button and select Tags to search for the tags you need! Is there anything we're missing with Tags at ClickUp? Let us know here!